A gang of people traffickers who showed "a complete disregard" for the safety of four Vietnamese men they smuggled into the UK have been jailed. Thomas Mason and Hoa Thi Nguyen were both jailed for eight years after being convicted of conspiracy to facilitate the illegal entry of foreign nationals into the UK via the Kent coast. Four of their co-conspirators were also sentenced at St Albans Crown Court. The judge said the group had shown a "callous disregard for safety". The court heard the smugglers used a dinghy bought by Mason and Nazmi Velia to ferry illegal migrants across the English Channel. 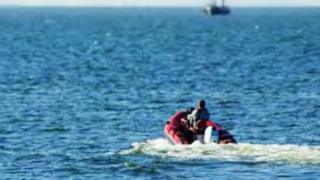 During surveillance by the Eastern Region Special Operations Unit and Border Force, they were seen repeatedly launching the small rigid inflatable boat before landing with four migrants on board on the beach at Walmer on 3 August 2018. Mason, 36, of High Street, Eyeworth, near Biggleswade, the pilot, had a life jacket but his human cargo did not, the court heard. Hoa Thi Nguyen, 49, of Bisterne Avenue, Walthamstow, east London, co-ordinated the journeys, including previous failed attempts. Her partner, Chi Tan Huynh, 41, of Wharf Road, Hoxton, east London, was also found guilty and was given a 30-month sentence. Of those who had admitted their part in the conspiracy, Kosovo-born Velia, 32, of Park Street Lane, St Albans, was jailed for five years and four months and Erald Gapi, 27, of Abinger Grove, Deptford, south London, 21 months. Wayne Lee, 46, of Grasmere Close, Watford, was given two years. Egert Kajaci, 35, of Turner Drive, Oxford, who drove the car containing the migrants, which was stopped by police, will be sentenced on 18 March. Judge Robert Winstanley said the plot was a "professional well organised conspiracy, purely motivated by financial gain" and said the group had shown a "callous disregard for safety".